Before I talk about this error message, I want to apologize to followers and students I had promised this post a while back. Sorry for delay, I will try to be more prompt on my future posts. Anyhow, so how many people have seen that exact message? “Login failed … ‘NT AUTHORITY\ANONYMOUS LOGON'”? What does this message even mean? And why do I have to deal with it? In my experience I have seen this message in three or four difference cases. I think in all cases the issue is similar, so I hope this post helps your troubleshoot and fix this issue within your environment. When running reports on SQL Server Reporting Services (SSRS) for some reason I keep getting login failed with ‘NT AUTHORITY\ANONYMOUS LOGON’. I am not sure what is going on, the connection string for report is set to “Windows Integrated Security” like in image below. I have access to the server, I confirmed my login “Domain\username” has full rights to the SQL Instance and database, hell I am “sysadmin”; there should be no reason to get this error message. Well one can say it is an issue with your connection string? That is you have it set to “Windows integrated security” that is why you are getting this. So people often either a) hard code SQL Server login credentials or b) a service account credentials within the connection string. All-in-all, I don’t have problem with that however it makes it hard to control what an individual can execute or what they have permission to. Windows integrated security is a good approach. That said what is the issue then? Go to Reporting Services Configuration Manager. Confirm that you have Service Account set to a Domain Account and NOT Network Services (Default). Check for Service Principal Name using following command:”SETSPN -L Domain\ServiceAccountName” (this is your SSRS service account). You should have one SPN “http/servername.FQDN”. If you are using non-default port (other then 80); than it should be “http/servername.FQDN:PORT”. If you are missing the SPN please add it using the following command:”SETSPN -A http/servername.FQDN:Port Domain\ServiceAccountName”. 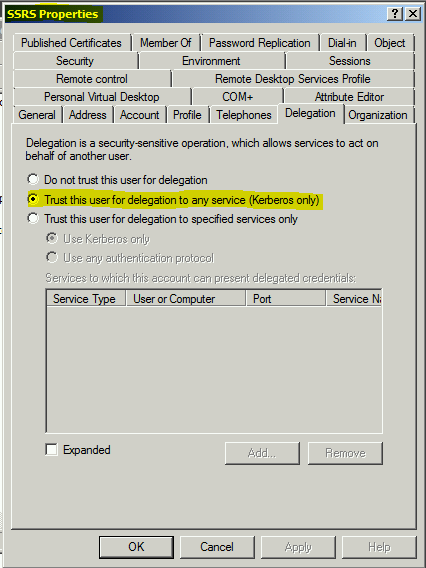 Now go to your Active Directory administrator and ask them to give the SSRS service account we created SPN for in step #7, Delegation rights under Delegation Tab, “Trust this user for delegation to any service (Kerberos only)” as in screenshot below. If you try to run your report it should work now :). If you guys have any other issues please let me know. If you change service account in your SSRS, please back up the encryption key before changing. If you are using single service account for everything (not best practice), consider setting “Trust this user for delegation to specific services only”. Login failed for user ‘Domain\ServiceAccount’. Notice again same failure is noted in middle of API cursor calls; “EXEC sp_cursor ….,34,1” statement means to delete the current record. What was most confusing was why was SQL Server it self trying to login using another service account when delete got executed? Digging into the configuration a bit; I found someone had created a Linked Server to the local server. If you try to create Linked Server under (Server Objects -> Linked Servers) to local server you get an error message “You cannot create a local SQL Server as a linked server“. So how did this get added using the ‘Domain\ServiceAccount’ account? Looking at it a bit more it is possible to add a linked server to local server (its useless to do, as far as I can tell) by using sp_addserver stored procedure and then using sp_serveroption stored procedure you can set properties. But the GUI interface will not let you interact with the object. Could not find server ‘SQLServer’ in sys.servers. Verify that the correct server name was specified. If necessary, execute the stored procedure sp_addlinkedserver to add the server to sys.servers. Server ‘SQLServer‘ is not configured for DATA ACCESS. Now reading Pinal Dave’s blog some people suggested enabling RPC Out property; now this is valid for a linked server. But this was not linked server so why did I have this error? Looking at @@ServerName, it was still ‘NULL’; even with record id of 0 in sys.servers. This is because global variables like that are populated at boot time, so I had to restart SQL Server services before that variable was populated. After @@ServerName returned proper value; the web service started running also. I’ll be investigating the link between API cursors and @@ServerName in another article; for now problem solved. Problem: Unable to do delete operations in an application that relies on API Cursors. Solution: Check to make sure the @@ServerName property is set; if not check sys.servers. If there are no rows in the table. Add new entry using sp_addserver and restart SQL Services. SQL Learnings, Error 14274. Link. SQL Learnings, Error 18456. Link. Journey to SQL Authority with Pinal Dave, Error 7411. Link. API Cursors. System Stored Procedures. Link. SQL Server Performance. Exposing API Server Cursors. Link. The document referenced below explains all the states, this is just a summary. Only state returned in SQL 2000. Seems to be catch-all where no other states apply; for example Account Disabled shows up as State 1(2005). Valid login but server access failure; CONNECT permissions is set to DENY for the login. Server in process of shutting down, and user attempted to login. In SQL 2005 it reports as state 1, user is not associated with a trusted account. Updated: March 6th, added state 38/40 for SQL 2008. Updated: March 12th, added a bit more detail about state 11/12 and added state 1. Updated: April 14, 2011, added state 58. Updated state 5, 11, & 12. If I added (Version); it means I have confirmed/found it on that version. Updated: November 22, 2011, updated the state 8, what is invalid password?